Albert O. Kenneally, aka Albo or Al, died Saturday, November 17, 2018, at the home of his daughter Kathryn M. Conner (Tre) in Drexel Hill, PA. He was 90 years old. Albert was the son of Daniel James and Mary Catherine Kenneally (nee McGrath). He was born at home on September 25, 1928, in Dubuque, Iowa. He was preceded in death by his devoted wife of 55 years, Dolores “Dee” Kenneally (nee Murray) in December of 2011, his sisters, Ilene Jane in December of 1934, Mary Agnes Holt (Ray) in October 2010, and his niece Jacolyn Jones Collins in May of 2018. His youngest sister Catherine “Kate” Jones is a retired nurse residing in Margate, Florida. In addition to his daughter, Al is survived by his son, Daniel Patrick Kenneally. 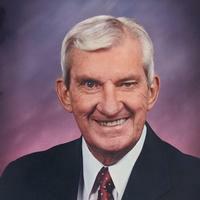 He had five grandchildren: Sarah Conner West (William), Catherine M. Conner, William H. Conner IV “Chip”, Elizabeth F. Conner, and Skye Lynne Kenneally. Additionally, his two great grandchildren Gracie Mae West and William Conner West adored him. He had a jelly bean machine. Al graduated from St. Columbkille’s in Dubuque, attended Loras College and graduated from the University of Washington in Seattle. We were told that he had to leave Loras because East Dubuque was too much fun. He served in the U.S. Marine Corps twice; but he never left California. After his discharge, he returned to Dubuque and married Dee Murray on April 19, 1952. That is when they began their life of moving. Their journey took them from Marian, Iowa to Cedar Rapids, Iowa; where he started his career at W.R. Grace. They were transferred to Greenville, SC, Sinking Spring, PA, and Roanoke Rapids, NC. At the age of 50, Al left W.R. Grace and started his own sales agency, AOK Sales. At 66, they retired to Sun City West, Arizona so that Al could play even more golf, in better weather. Al’s passion for golf began in Dubuque when he caddied at the Dubuque Country Club. He claimed to have started playing at age six. The caddies and staff were allowed to play for free on Mondays, when the club was closed. He played every weekend of his life and daily in retirement. He shot his age until an injury turned him into a PGA Tour television fan. Al was a devout Roman Catholic. He lived across the street from St. Columbkille’s and was the permanent sub, whenever an altar boy didn’t show up. He said that it was good to have a lot of Masses in the bank. He always had his medal on and his Rosary in his pocket. His death was so quiet and peaceful, that his children said it was as though he simply got up and left. After all, he’d had his tea, read the paper and was halfway through his Sports Illustrated. He was a devoted husband and a tender, loving father. Al was a steadfast brother, a generous uncle, and an exuberant and loyal friend. He had a formidable intellect and read voraciously. Al was easily delighted and delightful. He will be terribly missed by all. Relatives and friends are invited to attend Albert's Memorial Mass on Saturday, December 1, 2018 at 11am at Saint Andrew Church 3500 School Lane Drexel Hill, PA 19026. Interment will be private. In lieu of flowers, donations in his memory to St. Jude’s Children’s Research Hospital, 501 St. Jude Place, Memphis, TN 38105 would be appreciated.